I was fully prepared to dislike this show, and I don’t even know why. It could simply be a bias against the CW, which typically caters to a demographic that is not me, or just a feeling that zombies have overstayed their welcome. But I didn’t expect to like Veronica Mars, either, which is from the same creators, and it turned out to be my favorite show, probably ever. Within the first few minutes of watching the pilot, a few associations were made or unmade… Liking this show will have no correlation to whether you like The Walking Dead or other, more traditional zombie fare. Ditto for police procedurals although that’s technically what it is. 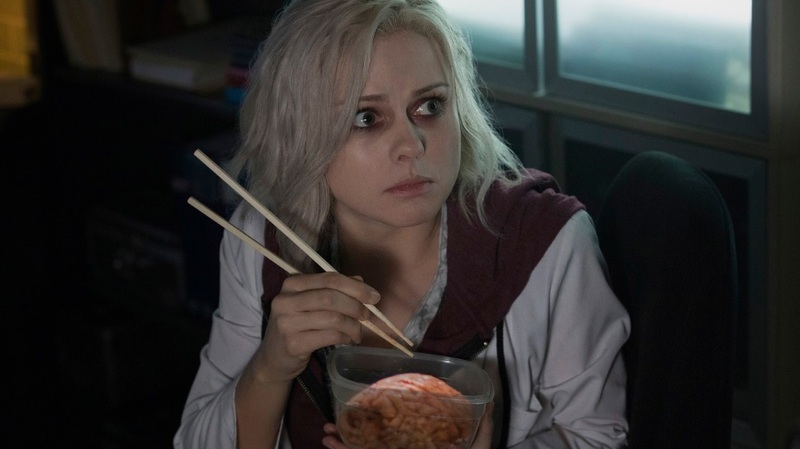 Your enjoyment of iZombie may, however, correlate with your enthusiasm for quirky, darkly humorous shows like Wonderfalls, Pushing Daisies, Being Erica and, of course, Veronica Mars. We meet dark-haired, rosy-cheeked Olivia (Rose McIver) during her medical residency. Each segment of each episode has its own title, and the opener is, logically, “Life Before Death.” Just a few quick strokes paint a picture of a confident over-achiever with the perfect fiancé (Robert Buckley). A couple more minutes and we’re full throttle into the incredible story of her transformation into living dead girl. The ensuing rapid fire pace of character introductions on top of a corpse-of-the-week plot, served with a comic book vibe, doesn’t let us stop to worry about realism. She’s dead. She eats brains. She sees visions belonging to the former owner of said brains. Her talent quickly comes in handy when Clive (Malcolm Goodwin), a detective just transferred to homicide, is stuck for leads. And just as we accept that Liv is walking around, basically immortal, and feeding at the morgue where she now works, so does her boss, Ravi (Rahul Kohli), accept it. He’s completely deadpan when he admits he knows her secret. (See the look on her face, above.) In case there’s any doubt Ravi is a trustworthy ally, he covers for Liv by telling Clive she’s a psychic. One might expect Clive to take a bit longer to buy the explanation, but seemingly, his desperation to solve the case leads him to fully embrace it. Matter-of-fact though she is about her new lifestyle, Liv is a broken woman. She can’t sleep. She’s lost the love of her life, along with her best friend (Aly Michalka). She genuinely feels that her life is over. As I watched Liv mix call girl cerebrum into her ramen, I admit to feeling a bit squeamish, but it’s amazing how fast you can adapt to this bizarre habit. You get the sense that she, herself, has figured out how to make it work even though she horrifies herself. The case of the week gets a bit convoluted, which I initially saw as a weakness of the pilot. As it turns out, this show is red herring city, so don’t write off the individual cases. As on Veronica Mars, each one forms a piece of an enormous puzzle that I’m hoping will span more than just this season. The pilot also introduces us to weatherman Johnny Frost (Daran Norris), who will reappear in a later episode. He’s not the only VMars alum to pop up in the first season, either, so get to watching if you haven’t already! The pilot goes out on an adrenaline-laced mix of emotions. Importantly, by the end of the episode, Liv is no longer a victim. “Seriously, how did you solve crime before me?” she asks Clive. On rewatching, I spotted a few things that could be clues to what’s going to happen in the season finale. 1. Liv’s mother remarks on “how many women would kill to be with a man like this,” in reference to Major. Foreshadowing? Will Liv have to kill for him? 3. Peyton talks about her unwillingness to walk away from Liv, even though Liv is not herself. Did she mean it? This entry was posted in 2010s, Comedies, Dramas by meekthegeek. Bookmark the permalink.